EveryMom'sPage: Can Braces Damage Gums, Teeth, or Roots? Braces are important to having healthierr teeth and gums in the long run, but are your teeth, gums, and roots actually at risk for damages while wearing them? It is true that braces are responsible for “reconstructing” the overall placement of your teeth. Bones, teeth, roots, and gums will be affected, but this is temporary and sometimes necessary to achieve the ultimate goal of having straighter teeth and a proper bite. During your initial consultation with your orthodontist, the doctor will address potential problem areas with you. Some people will experience minor inconveniences at first, but over time and as you get used to wearing your new braces, things will improve dramatically. Not all people will experience minor problems but some may notice bleeding gums. This is perfectly normal, and it is mostly due to lack of proper brushing and flossing and it should subside in only a few days. Braces are traditionally placed on children and young adults because their bones are still growing and are softer and more maneuverable during development. This allows for boneto move and roots to readjust below the gum line while the teeth above the gum line are being maneuvered by the braces. Sometimes tooth root damage may occur, but a good orthodontist can help you to manage and prevent this from occurring. The best way to prevent gums bleeding while wearing braces is to brush your teeth and practice good oral hygiene. “It is imperative that you brush your teeth twice a day for at least two minutes at a time” recommends Dr. Nima Hajibaik of Newpark Orthodontics. Brushing and flossing is the easiest way to prevent your gums from getting swollen and irritated, and to keep teeth from bleeding with braces. If you have any concerns or questions regarding discomfort while wearing braces, please ask your orthodontist if he can give you a few tips or any information on how to manage the initial irritation that is sometimes associated with braces. A prime example of the more you care for your teeth, the less they will bleed by flossing and brushing regularly is this: You may remember (or notice) when you first started flossing, this would cause your gums to bleed and they became inflamed, but the more often you flossed, the healthier and stronger your gums became. So, overtime, things got better. In extreme cases some may experience Root Resorption, which is a shortening of the tooth roots, but this occurrence is usually not due to orthodontic treatment, and can occur with or without the application of braces. Your orthodontist will be able to check for potential problems in this area during your initial consultation, but this condition is usually very rare and not problematic for most. It is best to let your orthodontist know if you have suffered any trauma to your teeth such as sports accidents or even if you had a tooth knocked out by an injury or during athletic activity. If root damage is already present, your orthodontist will make the necessary adjustments and take any precautions, and proceed from there. 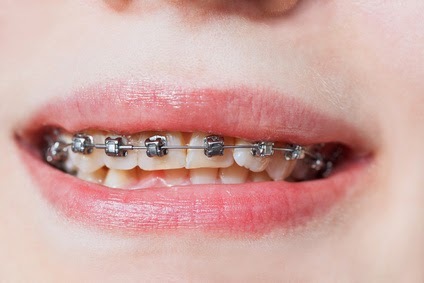 Overall, the best and most practical way to avoid damage to your teeth, gums or roots is to establish a regular routine of brushing and flossing, avoid sugary or acidic foods, keep routine visits with your orthodontist to ensure everything is moving along as it should, and wear a mouth guard while engaging in athletics or play. About Newpark Orthodontics:Newpark Orthodontics is located in Alpharetta, GA and serves the Roswell and Johns Creek communities. Dr. Nima Hajibaik at Newpark Orthodontics provides braces and Invisalign along with other orthodontic treatments for children and adults. To learn more about Newpark Orthodontic visit newparkortho.com or call (678) 389-9400. I had braces before, I think the damage it left my teeth was it left a yellow stain that can't be removed by brushing alone. I have yellowish teeth and after the braces, my teeth's color got worse. I wore braces during my teens and it's really how you take care of your teeth while wearing them. Every time I go to dentist, they always offer me braces but I'm hesitant, feeling ko ang daming don'ts pag nakabrace. My daughter is wearing one from Myobrace. I'm documenting her progress and we recommend Myobrace a lot. Her teeth dramatically improved in just several months. I'm sorry; I really don't know anything about braces. I never had them and neither jag anybody in my immediate family. But I agree that one should always consult the dentist. I see some people doing DIY, scary! My daughter needs to have braces for her bottom front teeth and we're looking into it soon since she's already 13.